Twospotted spider mite, Tetranychus urticae Koch is a major pest of strawberries in California. 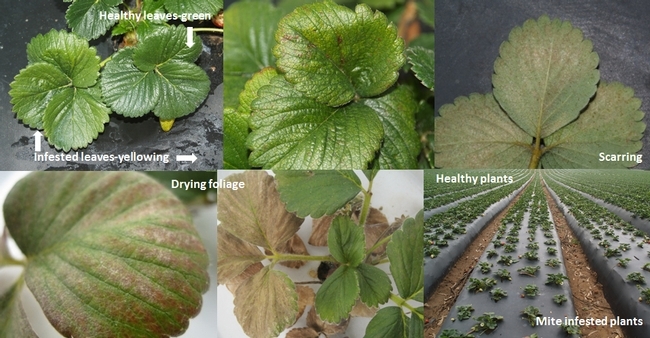 Spider mite damage reduces plant vigor and contributes to yield loss. Twospotted spider mites are typically found on the lower side of the leaf and form webbing at higher population levels. Damage: Spider mites cause damage by puncturing the epidermis with their mouthparts and sucking the plant juices. Death of plant cells appears as yellow mottling during initial stages and as feeding continues, damaged areas coalesce and result in scarring, bronzing, and drying out of leaf tissue. This reduces the photosynthetic ability of the plant and thus its growth and vigor. If left uncontrolled, damage leads to stunted plant growth or eventual death. Damage symptoms are unique in Benicia variety where upper leaf surface corresponding to spider mite feeding on the lower side, shows purplish coloration. Biology: Life cycle includes egg, larva, protonymph, deutonymph, and adult stages. Females lay an average of 100 eggs in 10 days. Eggs are round, initially translucent and turn whitish as they mature. Larvae have three pairs of legs and nymphal stages have four pairs of legs. Males are wedge-shaped and about 0.3 mm long. Females are oval, 0.4-0.5 long, and have a single dark spot on either side of their body. At 85-90 oF, life cycle can be completed in 7-8 days. Management: Growers typically rely on biological and chemical control options for managing twospotted spider mites in strawberries. Type I specialist Phytoseiulus persimilis Athias-Henriot, Type II specialists Neoseiulus fallacis (Garmin), N. californicus (McGregor), Galendromus occidentalis (Nesbitt), and Type III generalist Amblyseius andersoni (Chant) are common predatory mites that attack twospotted spider mites. Releasing one or more species of predatory mites is a popular practice in strawberry production. Abamectin, acequinocyl, bifenazate, etoxazole, fenbutatin-oxide, fenpyroximate, hexythiazox, and spiromesifen are the most commonly used chemical miticides according to pesticide use reports of the California Department of Pesticide Regulation. Chemical miticide use shows a 2% increase in the Watsonville-Salinas area, an 82% increase in the Santa Maria area, and a 125% increase in the Oxnard areas from 2009 to 2013. There is a continued need for identifying effective chemical and non-chemical miticides to manage twospotted spider mite in strawberries. A small plot field study was conducted in 2013 at Manzanita Berry Farms in Santa Maria to evaluate the efficacy of various botanical, chemical, and microbial pesticides. Treatments included bifenazate (Acramite 50 WS at 1 lb/ac), abamectin (Agri-Mek SC at 4.29 fl oz/ac), entomopathogenic fungus Beauveria bassiana (BotaniGard ES at a lower label rate of 1 qrt/ac) + bifenazate (Acramite 50 WS at the lowest label rate of 0.75 lb/ac), rosemary and cotton seed oil (Eco-Mite at 1% concentration), fenpyroximate (Fujimite 5 EC at 2 pt/ac), fenpyroximate (Fujimite XLO at 2 pt/ac), Chromobacterium subtsugae strain PRAA4-1 (Grandevo at 2 lb/ac), Burkholderia sp. strain A396 (Venerate XC at 2 gal/ac), and cyflumetofen (Nealta SC at 13.7 fl oz/ac). A spray volume of 150 gal/acre was used with 0.25% non-ionic surfactant except for the treatment with B. bassiana, where an organo-silicon surfactant was used. Each treatment had a 15' long strawberry bed and treatments were replicated in randomized complete block design. Treatments were applied using a CO2 pressurized backpack sprayer twice at weekly intervals and eggs and mobile stages of twospotted spider mites and predatory mites were sampled 3 and 7 days after each application. On each sampling date, 10 mid-tier leaflets were collected from 10 random plants within each plot and mites were collected using a mite brushing machine and counted under microscope. Data were analyzed using analysis of variance and significant means were separated using Tukey's HSD test. Pre-treatment counts were not available due to a technical issue, so comparisons were made for pest and predatory mite counts after each spray application and the post-treatment period as a whole. Compared to untreated control, treated plots had fewer spider mites throughout the observation period, but the pest suppression was not statistically significant (P > 0.05, Table 1). 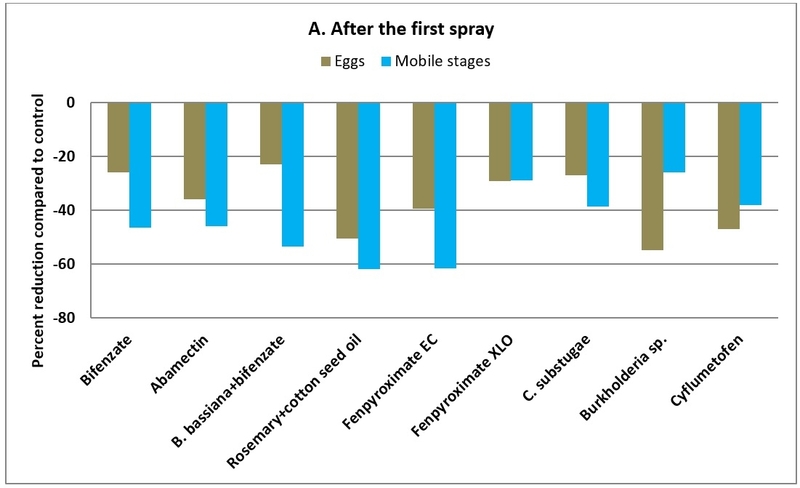 When the percent reduction in treatments relative to untreated control was compared, rosemary+cotton seed oil, fenpyroximate EC, and B. bassiana+bifenzate had relatively higher reduction in mobile stages while Burkholderia sp., rosemary+cotton seed oil, and cyflumetofen had a higher reduction in eggs after the first spray application (Fig. 1A). Reduction in mobile stages following the second spray was the highest in cyflumetofen followed by bifenzate, rosemary+cotton seed oil, fenpyroximate XLO, and EC (Fig. 1B). After the second spray, the highest reduction in eggs was seen in fenpyroximate EC followed by Burkholderia sp., cyflumetofen, rosemary+cotton seed oil, and B. bassiana+bifenzate. 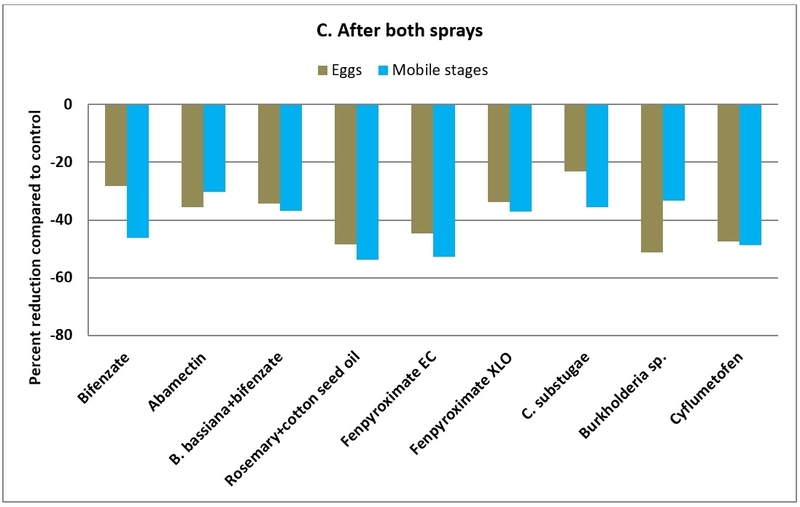 In general, rosemary+cotton seed oil treatment did a better job of reducing egg and mobile stages after both applications followed by Burkholderia sp., cyflumetofen, and fenpyroximate EC (Fig. 1C). Table 1. Number of eggs or mobile stages (mean+SE) of twospotted spider mite 3 and 7 days after first and second spray treatment along with post-treatment average. Fig. 1. Percent reduction in eggs and mobile stages of twospotted spider mites in different treatments compared to untreated control after first (A), second (B), and both spray applications (C). There were no statistically significant differences in predatory mite populations among treatments except in mobile numbers on 7 days after the first spray (P = 0.0046, Table 2). Plots that were treated with Burkholderia sp. and cyflumetofen had a relatively higher number of predatory mites and bifenzate and abamectin had lower numbers, in general. Table 2. 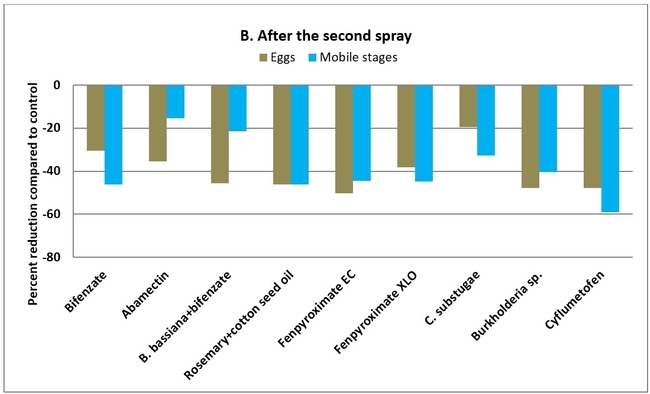 Number of eggs or mobile stages (mean+SE) of predatory mites 3 and 7 days after first and second spray treatment along with post-treatment average. Although treatment differences were not statistically significant, this study demonstrates the efficacy of various botanical, chemical, and microbial pesticides against twospotted spider mites and their safety to predatory mites. Results show the potential of non-chemical alternatives, which can be used in rotation with chemical pesticides for a sound IPM program. Obtain transplants from a clean source to avoid early spider mite infestations, which could lead to season long problems in production fields. Periodically scout the fields to evaluate infestation levels and make appropriate management decisions. Rotate chemicals among different modes of action groups and consider botanical and microbial control options to reduce the risk of resistance development. Understand the dietary preferences and environmental requirements of different species of predatory mites and release the right species appropriate for the situation. Avoid water stress for plants as spider mites thrive when plants are under stress. Excessive nitrogen fertilization encourages spider mite population build up, so optimize fertilizer input. Acknowledgments: Thanks to Dave Peck, Manzanita Berry Farms, Santa Maria for his collaboration, pesticide industry partners for the financial support, and Sumanth and Suchitra Dara for their technical assistance with mite brushing. Hoffland, E., M. Dicke, W. V. Tintelen, H. Dijkman, and M.L.V. Beusichem. 2000. Nitrogen availability and defense of tomato against two-spotted spider mite. J. Chemical Ecol. 26: 2697-2711.